If you’re deciding which truck you should buy, there’s no name more trusted than Ford. Ford trucks carry an automotive tradition of durability, reliability, and high-quality design. When you’re looking for a tough workhorse, try the new 2017 Ford F-150 and Super Duty trucks, as well as their rugged lineup of commercial trucks for the biggest jobs. Buying a Ford Truck | Which Model Is Best For You? Starting at $27,110, the Ford F-150 has earned some of the best accolades a truck can get, including Best Full-Size Pickup – Car and Driver 2017 10Best Awards. New for 2017, the Ford F-150 boasts a powerful new 3.5L EcoBoost® engine with 10-speed transmission, capable of a 12,000-lb maximum towing capacity. The new lightweight aluminum-alloy frame gives you more responsiveness and speed while keeping you safe. Choose from 7 impressive trims to match your need for power, performance, and luxury. 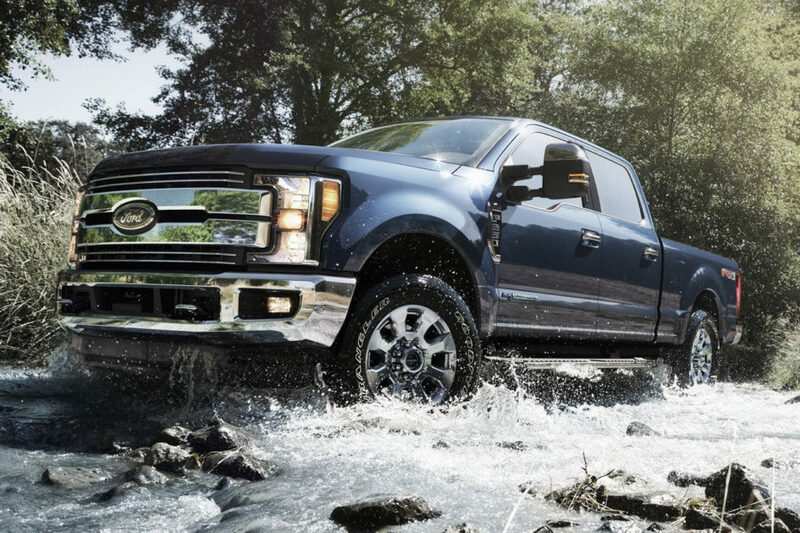 Starting at $32,535, the Ford Super Duty has been a consistent name in durability and best-in-class power. Like the F-150, the new aluminum alloy body makes for a sleeker, faster truck. But not to be outdone, the Super Duty adds reinforcements like stronger axles, sturdier steering capability, and a 95% high-strength steel box frame that is an incredible 24 times stiffer than the previous model. Get from double the towing capability of the F-150 to nearly 41,800-lb maximum when you choose the biggest and baddest of the 15 trims. Not to be outdone, Ford commercial vehicles like the 2017 Ford Transit series and Transit Connect are vans that embody hard work down to the axle. The Ford Transit features four models that can haul all your equipment or up to 15 passengers in a durable unibody design. The 2017 Transit Connect is a sleeker commercial van for smaller gigs that can take your gear or up to 7 passengers to the job site without a hassle. Equipped with MyFord® technology, the Transit Connect is at the cutting edge of technology and efficiency. You’ve got work to do. When you want a wide selection of reliable Ford trucks from a name you can trust, look to the friendly staff at County Ford in Graham, North Carolina to help. Just a short drive away from Burlington and Greensboro, schedule a test-drive in a 2017 Ford F-150, a Super Duty Ford truck, or a commercial vehicle for your business by calling (888) 500-7650.